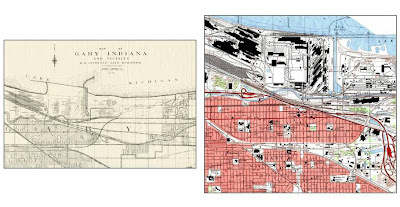 The maps from Ball State University Libraries GIS Research and Map Collection shown above are sections of the newest U.S. Geological Survey topographic quadrangle map of Gary, Indiana, versus the same area as seen on a map of Gary from 1935. The GIS Research and Map Collection (GRMC) in Bracken Library includes a number of maps of Gary, Indiana, Lake County, and the Chicago metropolitan region. The GRMC contains the newest editions of the Gary quadrangle map and copies dating back to 1953 for researchers wishing to see the changes in the city over time. Historical maps of the city in the GRMC date back to 1935 and include maps showing the development of the business section of Gary in 1949, the 1950’s, and the 1960’s. Two maps of different shopping centers of Gary from the 1950’s also offer historical perspective. The GRMC contains soil surveys of Lake County, aerial photographs of Lake County and Gary, and maps of Lake County and the region showing oil, gas, and products pipelines and physiographic and geological divisions. Many of the GRMC maps of Chicago and its vicinity include Gary. Also nautical charts of the Great Lakes depict the shoreline of the city of Gary. The Gary/Hammond “EasyFinder” map is a durable, easy-to-fold street map of the region available from the GRMC for travelers to the area. “Streetfinders,” guides, and an atlas called Lake County in Maps are located in the Atlas Collection. Plat books of Lake County are also located in the Atlas Collection. Maps from the GRMC circulate for two weeks or longer if necessary. Atlases circulate for 28 days. For more information about these cartographic resources, please contact the GRMC Monday through Friday from 7:30 A.M. to 4:30 P.M. during the summer at 765/285-1097.